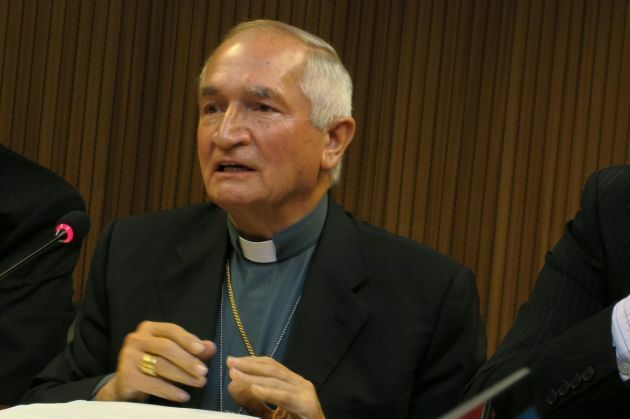 (Photo: Photo: © Peter Kenny / Ecumenical News)The Holy See's representative to the United Nations in Geneva, Archbishop Siavano Tomasi, speaking at a side-event on Syria during the Human Rights Council in Geneva, Switzerland on Sept. 17, 2015. "The war in Syria is a symbol of the instability of the Middle East. After four years of violence, 220.000 persons killed, 10 million forcibly uprooted people, and extensive destruction, there seems to be no sign of a solution. Although many declarations have been made and meetings held expressing sympathy for the suffering of the Syrian people and the intention to put an end to violence, no agreement has been reached and the bombing and killing continue. In some ways, this is a proxy war to decide on which power will exercise the most influence in the region. In fact, if the first circle of the conflict is that between the Government and its opponents, the second is that of Sunny countries and communities versus Shia ones and the third implicates the great powers of the United States and the Russian Federation. The complexity of interests challenges any attempt to dialogue and arrive at a cease-fire and putting an end to the violence. The emotional outflow provoked by the massive wave of refugees and asylum seekers reported in detail in the media distracts and diverts public opinion from looking at the root causes. As Chaldean Patriarch Louis Raphael I Sako stated in a recent interview, "This question cannot be dealt with in a sentimental or superficial way.• What. is required here is discernment. The only lasting solutions are those which can be implemented on the ground. These kinds of solutions need time and patience in getting processes going and guiding them. But this does not seem to interest national leaders and international organizations. They prefer to let the public's emotions influence their actions."! Among the questions raised by the persistence of the conflict a critical one regards the role of international institutions. Their inability or indifference to bring about solutions risks to weaken the entire multilateral system. Arms and volunteers continue to arrive to the so-called Islamic State the sale of whose oil permits to pay for them. A journalist noted: "It is kept secret that most of the current events are the consequence of an international intervention policy. With a touch of irony, added: "Western Governments use a proven strategy: arming of fanatical rebels in order to get rid of unwanted rulers. The fact that this always happens at the expense of the civilian population, is predictable, but obviously accepted. It is a hard statement, but difficult to disprove". Looking ahead, the temptation of cynicism should be overcome. The biblical exodus from Syria and from other countries may force political leaders to take a new look at the root causes of this war and their responsibility in starting it. The violation of the human rights of people who bear the effects of the conflict, would demand a coordinated action to protect them. The whole issue of the responsibility to protect, and the conditions involved for such action, should be revisited by the international community. Stopping the suffering of people must be the priority. People come before power struggles and competition for influence. Every person counts in her God given dignity and inherent rights. Let's hope that reason may still prevail and all the concerned parties may open their heart to a constructive dialogue."